‘The evening of the absent guitars’ – that’s the name with which I will remember the evening of September 26th, 2015. 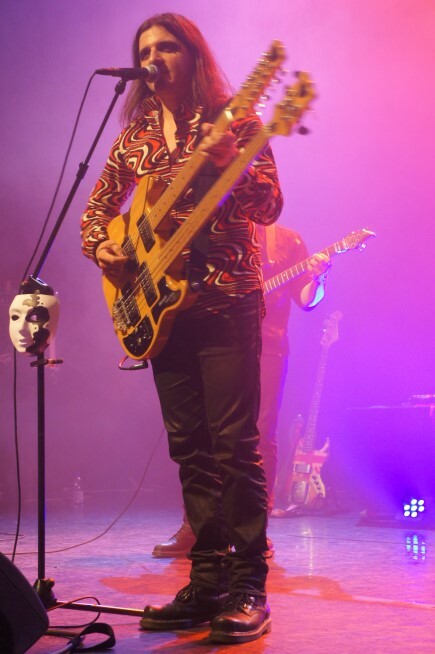 On this evening, two bands were scheduled for the Serious Music Event at Parkvilla Theater in Alphen aan den Rijn: symphonic prog band Traumhaus from Germany, and progressive rocker with a twist Franck Carducci from France, whom we still like to think of as ‘from Amsterdam’. Traumhaus had the honour of opening the evening, and did that with passion. Initially hindered a bit by bad sound (the vocals and keyboards were muffled in the mix, but this got a little better shortly after) they opened with the title track of their 2013 album Das Geheimniss. A short restart was required, because band leader Alex Weyland had no sound on his in-ears. After that was fixed things took off more smoothly. Keyboard and guitar melodies supported by a powerful bass and non-trivial drum work (performed here by Ray Gattner, originally recorded by Jimmy Keegan on their last album) – that is how someone described their music to me, as this was the first time I was going to hear their music. That description was just about right, as Das Geheimnis showed, but then guitarist Tobias Hampl got struck by Murphy’s law. The sound of the guitar disappeared, and apart from short intervals would not return until the second half of the closing track. Although he tried and tried, with help of drummer Ray and one of the sound engineers, the amp would not cooperate as it should. Initially, bass player Till Ottinger managed to somewhat fill in the sound gap of the missing guitar but this clearly was not satisfactory to the band, nor the audience. To reduce the pressure, Alex Weyland performed three tracks by himself, just vocals and keyboard: Wandler, Die Flut/Here Comes the Flood (originally by Peter Gabriel) and Die Andere Seite Teil 2. For closing song Das Geheimnis Teil 2, Tobias was able to rejoin. As it turned out, only in the second half of the song his amplifier would really cooperate, so the audience could get a feel for what he is capable of and what the band sounds like when complete. A pity for the audience and even more so for the band – as I listened to some of their music the day after their performance, they deserved a bit more luck on the day. Hopefully they get another chance at Parkvilla Theater in the near future. Franck Carducci then took over, after a short break. Here, guitarist Christophe Obadia was the missing link. He strained his back and ended up in the hospital in France, unable to perform. A bit luckier than Traumhaus, Franck and his band had a day to prepare for this and decide how to deal with the missing guitar. In the end, some parts played by Christophe were taken over (and almost flawlessly) by second guitar wizard Mathieu Spaeter – and some were replaced by some smart bass playing on Franck’s part. With that, opener Torn Apart, which on the album clearly drives on the sound of Christophe’s Gibson Les Paul, got a slightly different, but very appreciable arrangement. The same happened with Mr. Hyde And Dr. Jekyll, which Franck described as his attempt to write a heavy metal song and then dedicated it to the absent Christophe. The first time I saw this band perform live was an impressive show at ’t Blok in Nieuwerkerk on February 1st of this year, three weeks after the album Torn Apart was released. This evening I was impressed for the second time, and even more than the first time. Not only by the way they covered for the missing guitar, but also because of the way they have grown from a band into a stage machine. Constant eye contact, mastery of their instruments and a great visual show. The vocal performances of Franck and Mary Reynaud, on Artificial Paradises, Artificial Love, A Brief Tale Of Time and The Last Oddity were spot on – as were the brief front of stage appearances of drummer Nicolas Chonageokoff on backing vocals. 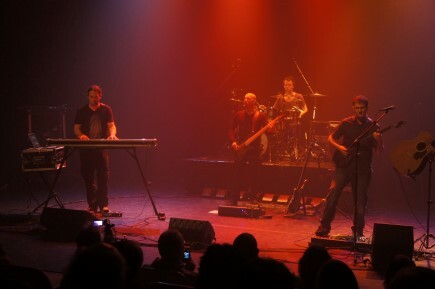 Outside these parts, in the instrumentals, Olivier Castan (keyboards), Mathieu and Franck took turns in leading the band. All according to the song structure on the albums of course, but sometimes also playing as if they were making things up as they went along. Maybe they were, after all they had to improvise, as Franck explained when he opened the show bringing the news on Christophe. Both of Franck Carducci’s albums have moments that give me goose bumps, and that was no less during this performance. The duets of Franck and Mary in The Last Oddity have that effect, but also the solo vocal of Franck on Mr. Hyde & Dr. Jekyll, or when he sets in Genesis’ As Sure as Eggs is Eggs. In a different way, the keyboard leads of Olivier and the lightning fast guitar solos of Mathieu give me shivers, and bare feet drummer Nicolas just manages to keep it all together. All of that was part of the show and in the end it all came together in encore and audience favourite Alice’s Eerie Dream. As always, with a special, very visual, sensual and humoristic role for Mary in the role of Alice. I saw a band perform this evening – even more so than in February. And an almost sold out Parkvilla Theater saw the same, I think.